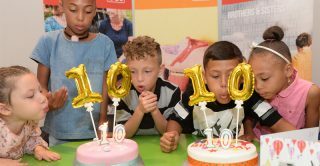 The children of the ‘Children of the 90s’ study members are celebrating their 10th birthdays. Cousins Scarlet and Coby are the daughters of twin sisters Zara and Josie, who are two of the children of the 90s. Researchers at the Avon Longitudinal Study of Parents and Children (ALSPAC) at the University of Bristol has been charting the lives of 14,500 people born in the Bristol area in the early 1990s for more than 25 years. By following the same group of people, the research team has made vital discoveries that are helping to treat and prevent ill health. For example, its discovery that peanut oil in baby oils and creams can cause peanut allergy led to changes in labelling on baby products in England. For the past five years the team has also been following the lives of the next generation of Bristol babies, known as Children of the Children of the 90s (COCO90s), which now number more than 650. Since the COCO90s began in 2012, the team has been gathering the same information about the health and lives of these babies and children as they did about their parents (the original Children of the 90s) when they were young. However, major advances mean they can now also collect data using state-of-the-art technology, such as head cams worn by parent and baby to see how they interact with one another an environmental sensor that checks the quality of air the baby or child is breathing. “We know that that health (or ill health) passes down generations and that this is not all due to our genes but also due to things like how much we exercise, where we live or whether our parents work. “By following the lives of the COCO90s children we are able to identify how we might stop poor health being passed from one generation to the next.